Opening word by Joseph Backstein (Moscow Biennale of Contemporary Art, Commissar), Irina Prokhorova (Mikhail Prokhorov Foundation, Director) and Olga Shishko (“Pro&Contra”, Art director). 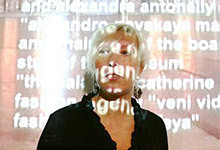 Olga Shishko (“Pro&Contra”, Art director, art critic, MediaArtLab director) — Media Invasion: practices, methods and spaces. NEXT IDEA | Ars Electronica (Austria) award winners. Pro&Contra Open Call. Projects of 2011 nominees. in the cource of presentation Alla Zagaykevich (Ukraine) Sound performance «Dérive». Constantine Bokhorov (PhD in Cultural Studies, curator, Russia) — Interactive media — between attractiveness and social criticism. Where the dogs run — "Precipitate", Olga Kiseleva — "Conquistadors at the North Pole", Dmitry Bulnygin — "Flowers", Gor Chahal "Free Love", Taus Makhacheva — "Bullet", Fedorova Tatyana — "I want to London", Natalia Arefieva, Anna Kolosova — "H2Opera", Anna Khodorkovskaya — "Bears". Best art-works of Japan Media Arts Festival, Prix Ars Electronica (Austria), LOOP Festival (Spain). A tour (for participants of the symposium) through the 4th Moscow Biennale’s main project (“Changing the worlds”) together with the Moscow Biennale’s Commissar Joseph Backstein and Curator Peter Weibel. Daria Parkhomenko (Director, curator LABORATORIA Art&Science Space, Russia) — Case study: Analysis of trends and winners in the nomination Hybrid Art at Ars Electronica Festival 2011. Partisipants: Boris Debackere (V2 Unstable Media Institute, Netherlands), Kate Gandrabura (Special Projects Department, ROSNANO, Russia), Attila Nemes (The Kitchen medialab Centre, Hungary), Irina Aktuganova (Zimin Fund, Russia), Alexei Shulgin (Electroboutique, Russia), Alina Ignatova (MediaArtLab, Russia), Anna Belyaeva, Olga Barkovskaya (independent curators, Russia), Mikhail Burtsev (Neurosciences department at the NBIC-centre — National Research Centre at Kurchatov Institute, Russia), Martin Honzik (Next Idea, Ars Electronica, Austria). Online participants: Dietmar Offenhuber (artist, Austria), Oron Catts (Art Director of the «SimbioticA» Laboratory, Australia), Ksenia Fedorova (Senior Researcher, Ekaterinburg branch of the NCCA). Julia Borovaya, Sergei Kasic, Vadim Smakhtin — "LIQUID ~ DO performance", Kawarga Dmitry — "Residual consciousnessstream-4", Bezshtanko Julia — "disappearance", Constantine Ager — "Memory of Rain". Alex Umansky, Sergei Ogirya — "House in the street". A film by The Yes Men group (USA): The Yes Men save the world (2009). Reports, the co-curator: Tatiana Volkova. Moderated by Tatiana Volkova, Ivan Zasursky. Participants: Dmitry Model (Media activist, Russia), Andrey Velikanov (Artist, philosopher, art theoretician, lecturer, Russia), Alexandre Bidin (Media activist, Russia), Artem Loskutov (Media activist, Russia), Roman Minaev (Media artist, Russia), Anton Nikolaev (Artist, Russia), Victoria Lomasko (artist, Russia), Dmitry Zhvania (mediaaktivist, Russia). Online participants: The YES MAN (USA), Avram Finkelstein (Activist, USA). Victoria Lomasko, Anton Nikolaev — "Forbidden Art", Anne Brochet — "Wikiantipedia", art-m2 — "GLOBAL ART PROJECT", Gregory Charushin — "Pink Fountain". 22.00 VIDEO PROGRAMME "MEDIA KICK"
Moderated by Asya Silaeva (MediaArtLab Center, Russia). Participants: Alexander Evangely (The Rodchenko Moscow School of photography and Multimedia, Russia), Daria Paramonova (Strelka: Institute for Media, Architecture and Design, Russia), Svetlana Maiborodskaya (Communications Academy, Russia), Alexander Mishin (British Higher School of Art&Design, Russia), Vlad Sevetsev (Audiovisual Academy, Russia), Olga Shishko (MediaArtLab CAC, Russia), Daria Kamyshnikova (Moscow Museum of Modern Art, Free Workshops program, Russia), Dmitry Galkin (University of Tomsk, Russia), Arseny Zhilyaev (Winzavod Centre of Contemporary Art, Start, Russia), Boris Debackere, Olof van Winden - Netherlands Media Art Institutes. Olof van Winden (Director of Montevideo - Netherlands Media Arts Institute, Founder/Director TodaysArt Festival) -TodaysArt Festival. The co-curator Sergey Kasich (Sound-artist, curator, Russia). Yury Kalendarev — "The Standing Wave", Ludmila Belova, programming by Sergey Komarov, Alexey Grachyov, Cyland — "A Time Capsule", Denis Perevalov, Nina Rizhskaya, Igor Sodazot — "Spherephonograph", Valery Aizenberg — "Simone speaks Russian". Residents of the SoundArtist.ru community (Oleg Makarov & Patrick K.-H.,:: vtol::, Kurt Liedwart, Kasich). One of the special projects of the Moscow Biennale of Contemporary art, PRO&CONTRA symposium is organized by "MediaArtLab" Centre for Contemporary Art and Culture. This year it's held for the second time and represents special space open for discussions, talks, free interaction of artists, curators, journalists, students and all interested in the most avant-garde and hi-tech contemporary creativity. PRO&CONTRA includes talks by theoreticians and practitioners of media art, PRO&CONTRA OPEN CALL prize for media art projects, exhibition project, workshops for artists, panels, screenings of worldwide media art festivals and performances of sound artists. The project is dedicated to media art and questions of art and technology interaction, it pursues educational aims and will help to invite more people into the process, create a new generation of artists, critics and curators. PRO&CONTRA is the next step of media culture development in Russia.